Can you name an SUV or a car for that matter that is being sold today that is as polarizing and unique to behold as the daring 2014 Nissan Juke? Even the bizarro Nissan Cube with its asymmetrical angles and oddball details doesn’t hold a candle to the unique set of thought that went into creating the Juke. But is it Nissan’s greatest SUV triumph or an epic fail that just so happens to also look like an endangered Amazonian river toad? Let’s have a closer look, shall we? 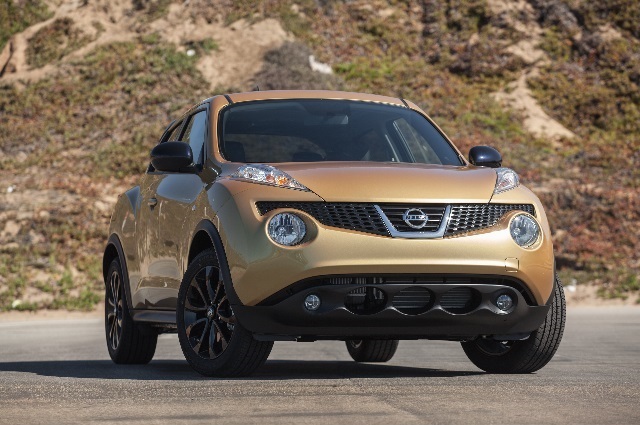 In order to get the best sense of what kind of vehicle the 2014 Nissan Juke really is, we tested two different flavors first off a front-wheel drive mid-level SV model with a six-speed manual transmission that really upped the fun to drive quotient. It also came in a rather sedate dark metallic color as the Juke looks best is hues that don’t overwhelm its already outgoing personality.